I love deviled eggs, don’t you? 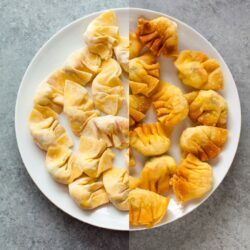 They are actually very very easy to make and the first appetizer everyone gravitates at any party or get together! 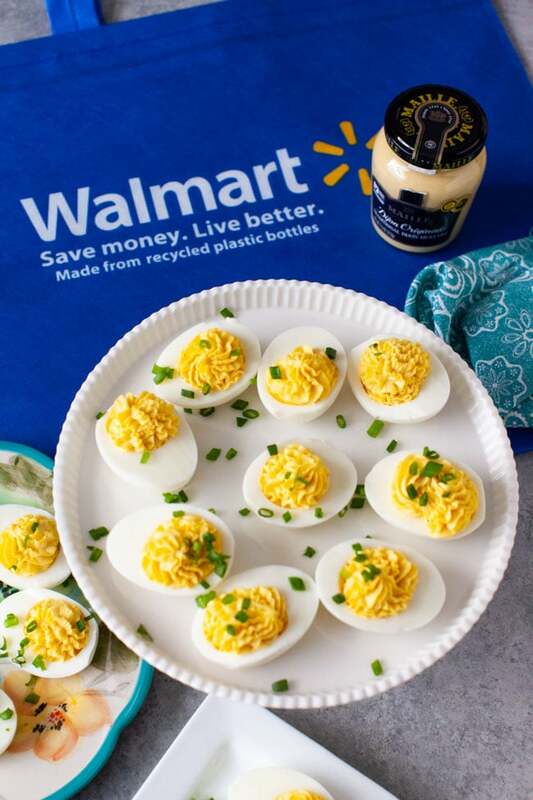 I’m excited to partner with Mirum to share with you this recipe for deviled eggs using Maille® Dijon Originale Mustard. 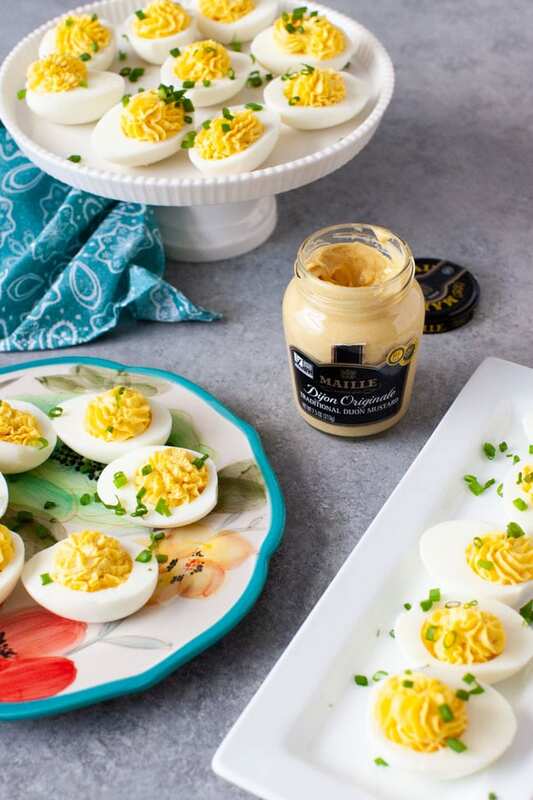 For as long as I can remember, dijon mustard was my secret ingredient to the best deviled eggs ever! 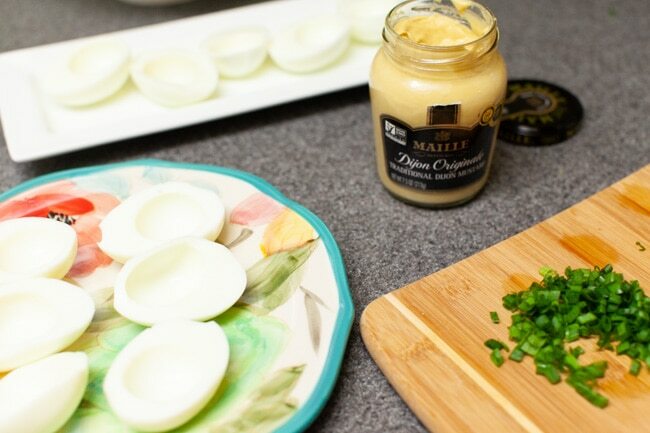 Maille Dijon Originale Mustard just elevates your recipes and takes deviled eggs to the next level! 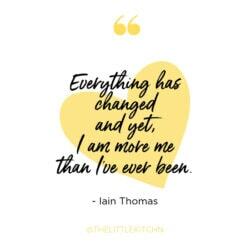 PS Now it’s no longer a secret! 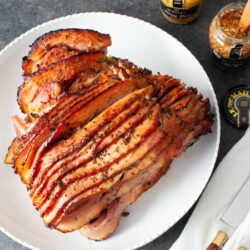 Maille Mustard is pronounced “My” Mustard, did you know that? 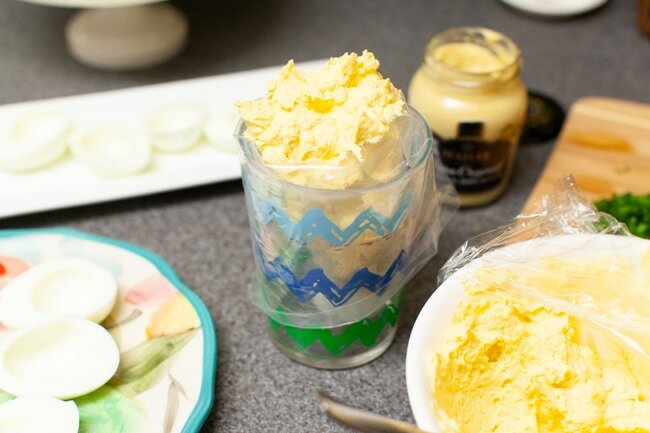 This recipe for easy deviled eggs would be perfect for you to share during Lent. 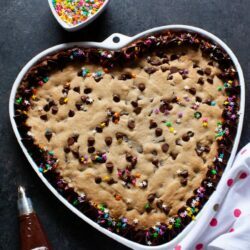 I know your family and friends will love it! Can Deviled Eggs be made ahead? 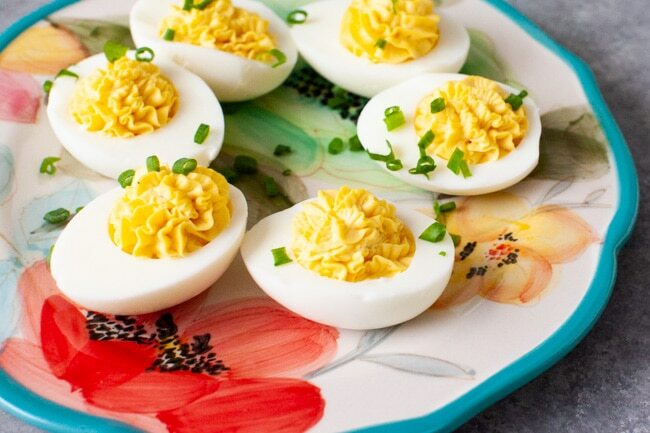 You can totally make deviled eggs ahead of time. 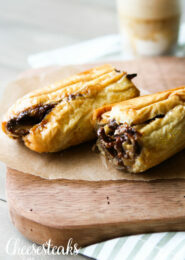 This recipe I’m sharing, you can actually make it a couple of days before serving them. Just remember, they need to be refrigerated! 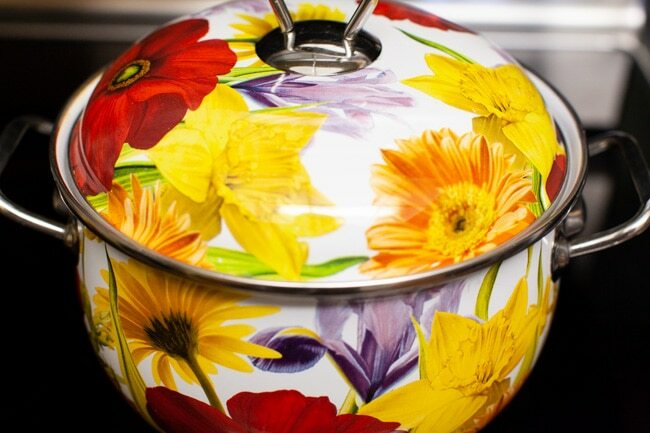 Add the eggs to a large pot and add water to fill the pot. 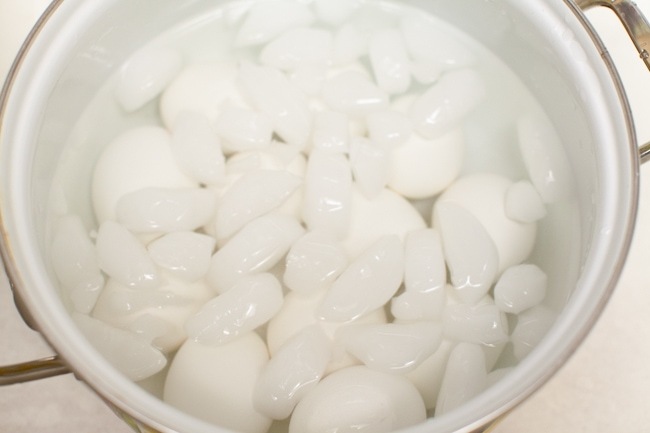 Make sure the eggs are covered with at least 1 to 2 inches of water above the eggs. Bring to a rapid boil. 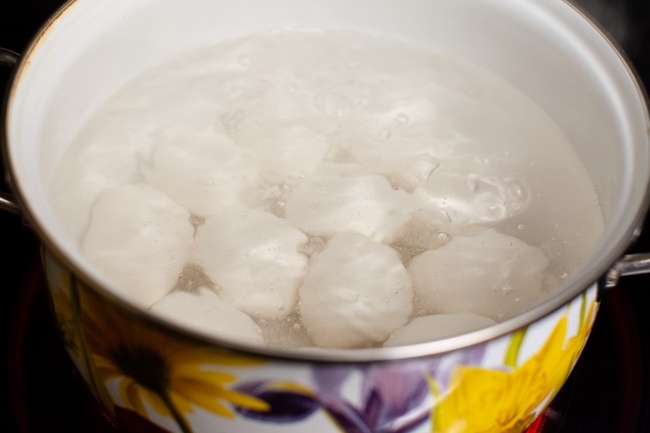 Once it starts boiling, cover the pot and remove from heat. Let the pot sit for 10 to 12 minutes. Drain the water and add cold water. You are going to need to do this a couple of times. Then, add 2 cups of ice and allow the eggs to cool for about 10 to 15 minutes. 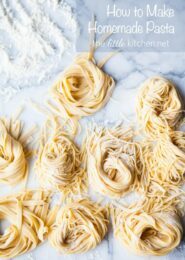 You can refrigerate them for a day or two with the shell on, if you’re not ready to make the whole recipe just yet. 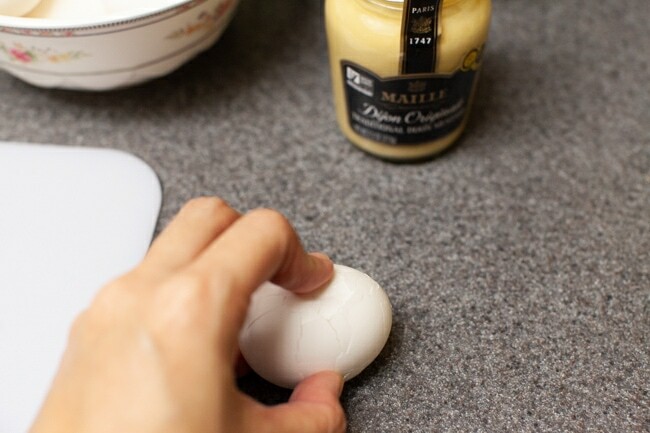 Gently crack each egg, I crack it on my counter and turn and crack again. Remove the shell carefully and rinse each egg. 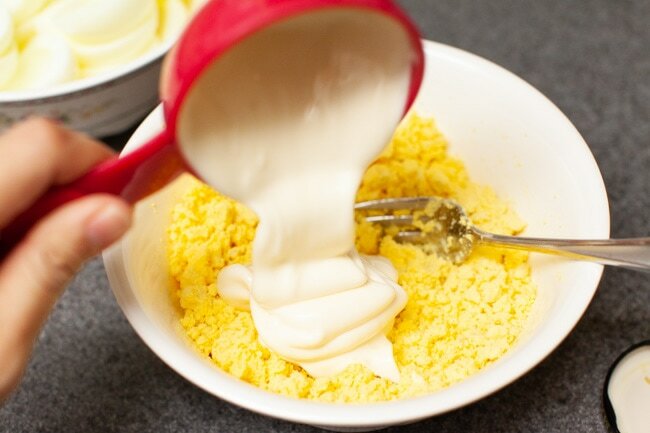 Cut each egg in half and remove the yolks and place in a small mixing bowl. Rinse the inside of each egg white and set aside. 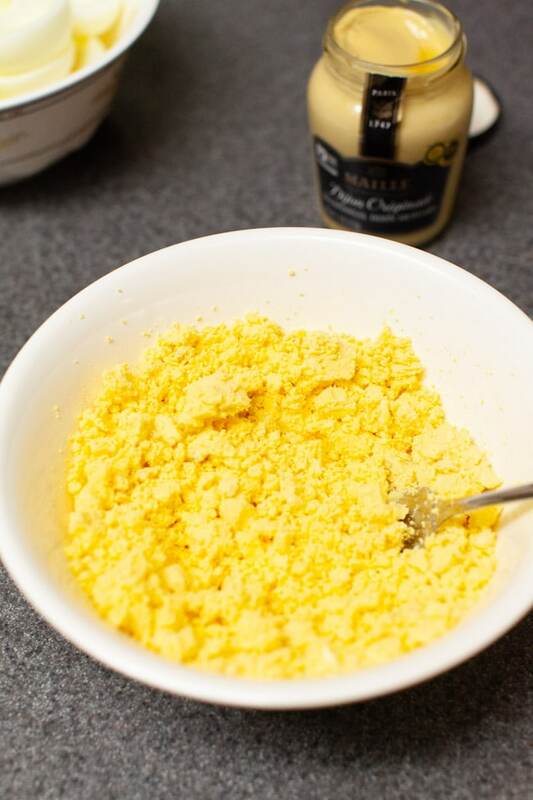 Add the Maille Dijon Originale Dijon Mustard and mix together. Add salt and pepper to taste. Be sure to rinse the egg whites. Add the egg yolk mixture to a decorator bag with a star tip. Pipe into egg whites. Serve with chopped chives. 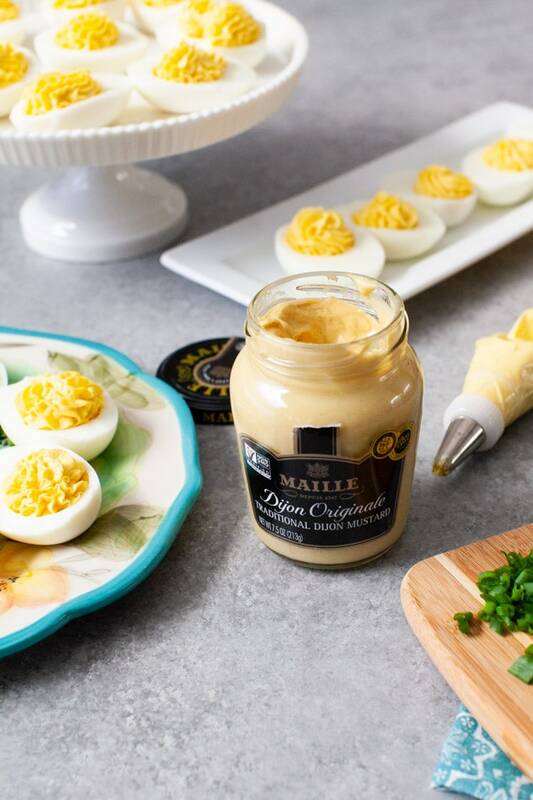 We love the taste of Maille Dijon Originale Mustard, it’s the perfect addition to any side or main dish and just elevates your dishes! 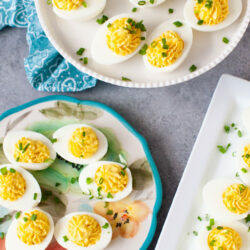 Aren’t these deviled eggs so simple to make? 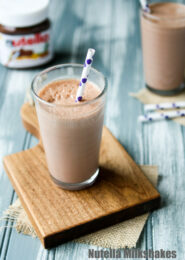 Impress your family and friends during Lent with them! 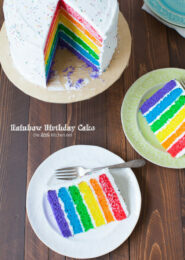 And even better, just six ingredients, all of which you can find at Walmart! Even better, you can save time by using Walmart Online Grocery Pickup. 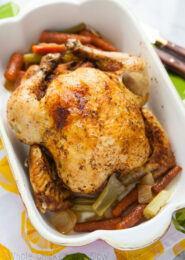 You can shop for your favorite Maille products and more for your Lent and Easter recipes! 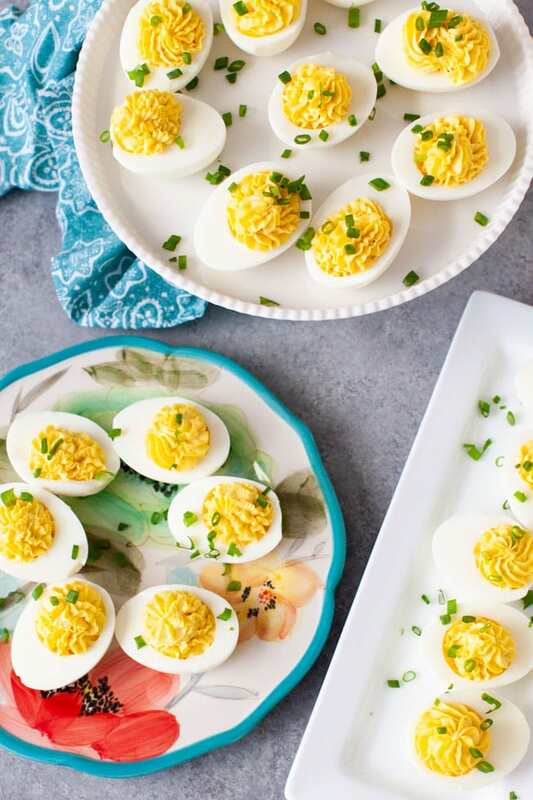 You can even have more fun with this recipe and make them colored deviled eggs for Lent and Easter! 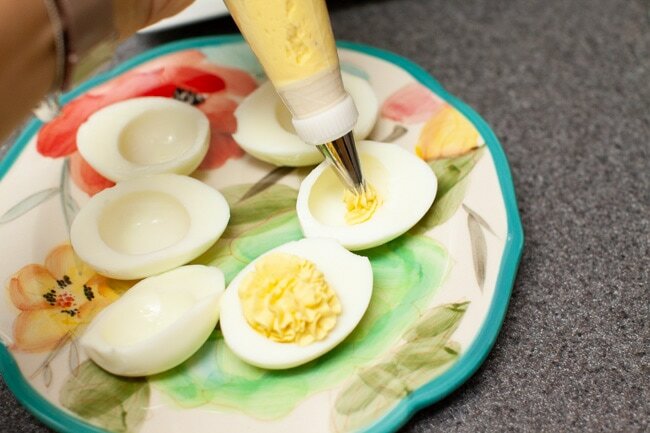 Using a fork, mash the yolks and add mayonnaise and Maille Dijon Originale Mustard. Mix together. Add salt and pepper to taste. Add the egg yolk mixture to a decorator bag with a star tip. Pipe into egg whites. Serve with chopped chives. 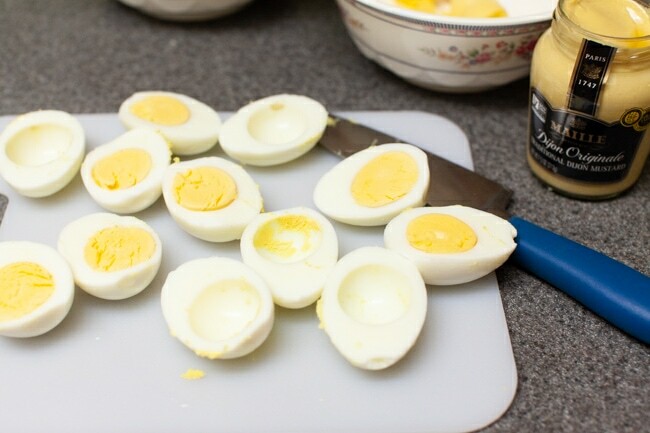 You can boil the eggs a day ahead of time. 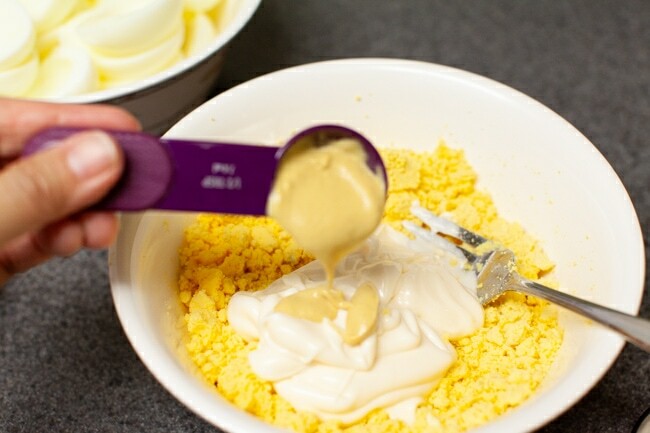 You can even prep all of way to piping the egg mixture into the egg whites. 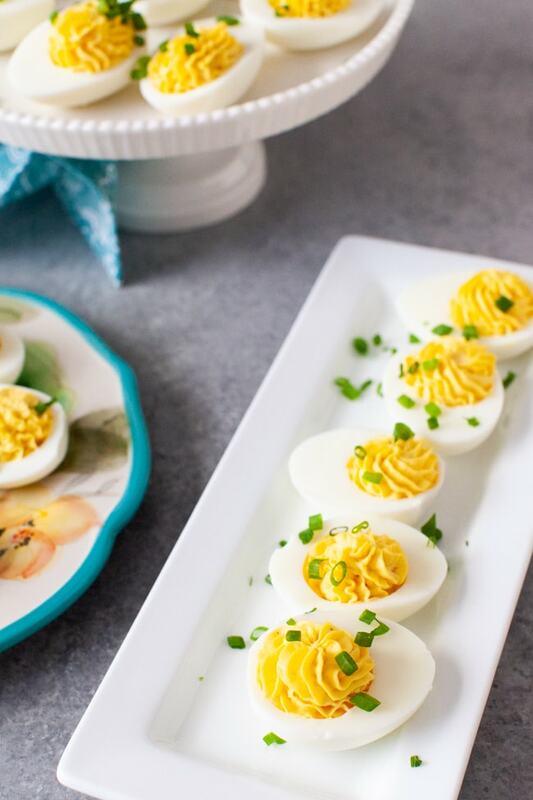 When you want to serve them or are getting ready for a party, pipe them onto the egg whites and cover and place back into the refrigerator until you’re ready to serve.